If anyone wishes to contact me about anything related to this article please phone +44 7502 427 238 or email alisdare@gmail.com. I would like to ask the British government what measures it will take with regards to influencing the Egyptian government to improve prison conditions. From my own experience of 54 days in custody in early 2012, 12 days in a police cell and 42 days in Tora prison, I would like to draw attention to the following areas where prison conditions where I was in Egypt fail to reach even the minimum conditions set by international standards. During my first eight days and last four days I was kept in a basement cell below Abdeen Police Station in central Cairo. Besides a small entrance area, the main cell area was approximately five by nine metres. During the first period I shared the cell with thirty other prisoners and in the second with over forty others. Obviously there was no space for any beds or chairs or any furniture. There was not even sufficient space on the floor to sleep. We were packed so tightly together that you had to sleep with your knees in the air and even then every half hour prisoners would accidentally stand on your feet while struggling to reach the toilet. “Every prisoner shall, in accordance with local or national standards, be provided with a separate bed, and with separate and sufficient bedding which shall be clean when issued, kept in good order and changed often enough to ensure its cleanliness”. The authorities would have found such a notion absurd. Prisoners had to provide their own blankets with which to cover the tiled floor and there was no place to wash them or hang them out to dry and some prisoners had not even a blanket either to cover themselves or to sleep on. This photograph is of a prison in Morocco but conditions at Abdeen were similar or worse. It was absolutely packed and very difficult to move. Spaces on the floor were bitterly contested. Cigarettes and cash were used to purchase relatively better floor spaces including spaces away from prisoners known to be difficult. These conditions might have been more excusable if Abdeen was just a temporary holding place but it was not. A lot of detainees I met on my first time there in early February were still there when I returned at the end of March. The medical and psychological consequences of being barely able to move in such overcrowded conditions for months on end must have been grave. The cell was only fit for a far smaller number. A Palestinian man told me there had only been fifteen prisoners a year earlier when he had been detained there briefly before starting his sentence but even that number would have been far too many. At Tora Mazraa, a large prison in the southern suburbs of Cairo where I was held for 42 days, the situation was better. Possibly because of my status as a foreign Westerner, I was lucky enough to be kept upstairs in a huge “first class” cell which included among its eighty inmates a former judge, at least one army officer and several business men. But even this “first class” cell was no luxury – the cell was comprised of nearly forty concrete bunk beds with just one narrow walkway down the middle. There was no space set aside for eating or other activities and prisoners ate their food either between the beds or in the washroom area. Also, whenever there were prayers five times a day the walkway had necessarily to be closed to accommodate those praying. The prison vans were also often seriously overcrowded with usually upwards of twenty, sometimes nearly thirty, prisoners packed handcuffed into fairly small prison vans with very small windows with mesh grills. Only some of the prisoners were able to sit and others had to squat or stand in handcuffs – often for hours. This was clearly dangerous in terms of what would happen in a road accident but of more immediate concern to inmates was that it created terribly hot conditions even in mid winter especially as no water was normally available. Even if someone happened to have a bottle with them it would disappear within moments when shared between twenty or thirty thirsty people. 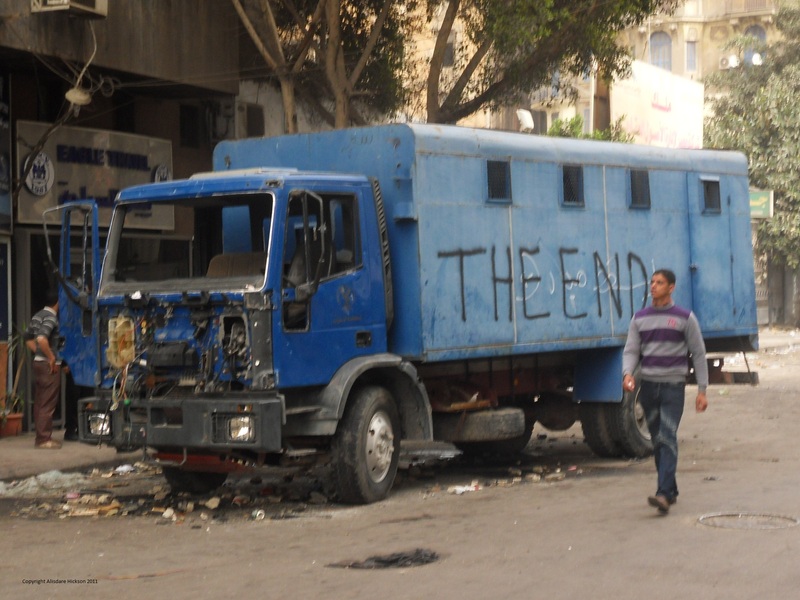 Photograph I took of a prison van burned out during the riots of Angry Friday on 28 January 2011 – this is the largest type of prison van but you can see how small the windows are – it was unusual for this size of van not to be carrying more than twenty and often nearly thirty prisoners. The rear quarter of the van is partitioned off by a wall and boltable door for the prison guards so the interior section is smaller than it seems. Due to the overcrowding and the small windows the temperature inside was very hot even in winter. The police station cages were another nightmare. This was where I and most other prisoners were kept on the first night and also often on return from court before being sent to a cell. They could become absolutely packed so there was not space to lie down. This meant either standing up for hours or only being able to lie down on top of someone else. Also there were no blankets or anything provided to help keep prisoners warm at night when the temperature often fell to around 5 degrees and sometimes to just 1 or 2 degrees above zero. At Abdeen due to the overcrowding, lack of any soap and lack of any pegs or space to put clothes it was impossible to wash properly. The toilet/washroom was a tiny space of little more than one square metre cordened off by a dirty sheet with a single squat style toilet and a broken tap with water continually cascading down the wall. The only place to hang clothes – one or two pieces at most – was a short piece of old string from which the partition sheet hung. However only privileged inmates (those dealing in drugs or who had supplies of cigarettes brought to them from outside) got to to use the washroom for enough time to be able to wash. Others who spent more than a few seconds inside would be turned out by those prisoners working directly for the kabeer, the mafia style boss among the prisoners. Garbage was stored next to the tiny washroom area and as a result pieces of rubbish would block the drain so that raw sewage would often flood the cell. Luckily there was a small raised ledge around the room on which people could store their blankets and this was high enough to stay above flood level but there was no possibility of sleep for anyone until the drain could be cleared. There was an open manhole which exposed the sewer drain just on the inside of the cell door. Normally this had a large dirty cloth draped over it so that we didn’t have to be constantly reminded of the full reality of our squalid existence. Whenever there was a blockage the inmates themselves would try to clear the drain using improvised tools. I watched as one man pushed a cut down plastic bottle attached to the end of a pole for over an hour without any success. On this occasion and many others it had to be done by someone from outside the cell which usually meant waiting at least several hours. At Tora Prison while there were sufficient shower areas you had to pay cigarettes to the kabeer to access them and there was running water only at certain times of the day so that the prisoners resorted to filling large five litre plastic containers with water every day. During prolonged cut-offs even these would run dry. There was no soap provided. At Abdeen the police didn’t supply any food to prisoners and all the food came from prisoners’ relatives. Prisoners alleged that officers were taking commission from relatives when they brought food. I once saw money placed in a police officers hand but I can’t say that this is conclusive proof. Foreigners without local relatives or friends had to resort to begging. It also goes almost without saying that in the small cell at Abdeen there was no kitchen or food preparation area or indeed any type of cooking equipment provided or even any type of electrical sockets. One result was that inmates boiled tea by burning plastic cups (they burn slowly) below a bottle of water. This created a hazardous level of smoke from burning plastic in a very confined space. There were only three small windows high up on one wall. During trips to and from the court the vans were often overcrowded and would frequently park in the sun for long periods of time during which the temperature would climb quickly. Several times prisoners became desperate in their pleas to guards to bring water. In one instance as I was being transported from my first court appearance water was deliberately denied for a long period and handcuffed child prisoners were beaten when they tried to take off their outer clothing and started begging an officer for water. Soon afterwards one collapsed from thirst. He was dragged out by his feet by the guards and the van door bolted again. It wasn’t until a considerable period of time had passed that they finally relented and brought some. Studies in the United States have shown that a parked vehicle under the sun heats up by 10°C above ambient temperature after just 10 minutes and to 23°C above ambient after 60 minutes ( statistics from the Department of Geosciences, SFSU, reproduced on ggweather.com ). 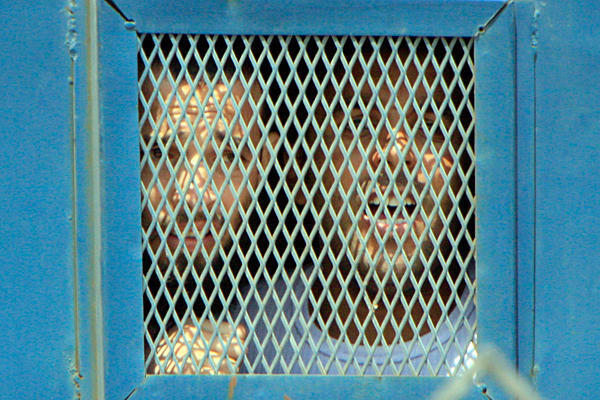 Egyptian prison vans are usually either blue or dark green in colour and so absorb the heat much more quickly than white vans and being so overcrowded with each prisoner acting as an additional heat source the internal temperatures may rise to levels considerably higher than those recorded in the U.S. experiments. During the summer months the average maximum temperature in Cairo is 35 or 36°C degrees, which means that you could expect the temperature of a parked prison van to reach at least 45°C after ten minutes and at least 58°C after 60 minutes ( that’s 136°F !). However temperatures in Cairo can soar up to 47°C which means the temperature in a prison van could reach 70°C ! At anything above 40 degrees you begin to sweat profusely. A chemist who helped Australian police recreate the internal temperature of an empty locked prison van when the outside temperature was 42 degrees commented that “It was like an oven…. We opened the back doors and could feel the heat coming out.” ( Kalgoorie Miner ) In Cairo temperatures can reach or exceed 42 degrees during seven months of the year ( BBC weather – Cairo monthly maximum records ). Unfortunately I have no details of prisoner mortality in such transport in Egypt. It is certainly possible such evidence has been covered up. In Australia in 2009 a 46 year old died in a prison van where the air conditioning had ceased working, despite having a 600ml bottle of water with him, after the temperature inside the van reached 50°C. ( watoday.com ) No prison vans I saw in Egypt had any sort of air conditioning and whereas the Australian prison van in this tragic case was white, which helps to reflect the sun’s heat, prison vans in Egypt are either blue or dark green. I was reluctant to drink a lot prior to van transportation to a court hearing because as explained in another section, the police often did not allow us access to toilets during hours of waiting in the courts. Also it would have been humiliating to have had to urinate in the van in front of other inmates. Luckily my detention period was during February and March and with external daily temperatures in the mid 20s the temperature in the van probably never exceeded 40 degrees. Even so I felt very ill on one occasion after returning extremely thirsty from a day in court and only recovered my appetite after several days. 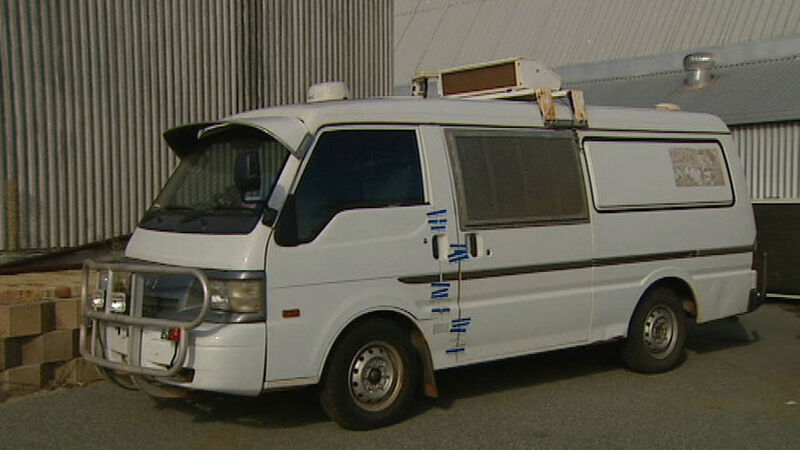 The white van in which the Australian prisoner died in 2009. It normally has airconditioning unlike Egyptian prison vans. A typical blue Egyptian prison van. Notice how small the meshed windows are. Blue will absorb much more heat from sunlight than white. Prisoners look out of a prison van. Source: Christian Science Monitor – 29 April 2010. Solar cells are often coloured “Egyptian prison van blue” because it’s so good at absorbing heat. A German prisoner injured his knee three weeks before I left. However, despite promises every week that he would be taken to a local hospital to have an x-ray, the promised transport never arrived and when I left he’d not even been supplied with a crutch to help him struggle from his bed to the washroom. I learned later that according to prison regulations newly arriving prisoners are all supposed to have a medical check up and an inoculation against typhoid ( Minister of Interior’s Decree no. 79 of 1961. ) Nothing of the sort occurred despite the fact that Egypt’s prison population is now double what it was twenty years ago (ICPS figures) and its’ prisons desperately overcrowded. Yet had I mentioned such a regulation to any of the prisoners or to the prison administration they would have just laughed. An article in the Austrian press claimed that corpses were left rotting on the floor of a cell at Tora ( Heute 18 06 2012 ). In fact the same cell I was in. I knew the man who was the source for the article – an Austrian remand prisoner called Hannes. He was a kind man and lent me a mattress, blanket and a packet of pot noodles when I arrived as I had very little with me. I never saw any corpses left lying on the floor myself but the medical “facilities” were so appalling at Tora that I can believe it. When I was first arrested and taken to Abdeen police station more than half of those being detained in the cage and on the ground floor of the police station were under eighteen. Some were clearly under sixteen and I later learned from a news report that one was just eleven ( see My Time in Tora Prison for reference details ). As described earlier in section 4 some of these children were deliberately deprived of water while in an overcrowded van and were later exposed to psychological noise torture ( see section 9 ) and then many of them were disembarked at a prison with adult inmates. I have no knowledge of whether they were kept in segregated cells but while I was in Tora prison I saw, on several occasions, one boy inmates said was seventeen though he looked younger, and he was kept in a cell on the first floor alongside over seventy adults. Four days later in a police van I was punched in the eye by a guard who told the others “foreigners like him are the ones responsible for stirring up all this trouble.” However another guard noticed and immediately yelled “Leave him. Don’t touch him” but I thik this was only because they were worried about possible complaints from my embassy. The officer reassured him telling him that he was just going to be transported with me to Abdeen police station. Once in the van a sympathetic guard asked him to lift up his shirt. I glanced sideways and noticed that he had marks which covered virtually every inch of his body. When he was finally disembarked at Abdeen he was so badly effected by the beating that whenever anyone approached anywhere near him he would flinch and tremor with a terrified look in his eyes. While I was in custody I saw several people who had been obviously badly injured by beatings including George Ramzi who had been arrested on Mohamed Mahmoud Street on 6 February and whose torture is described in a recent Amnesty International Alert. While I was in Tora Prison the biggest fear prisoners had was the punishment cells. I never saw one but I was once told that the authorities knew I had been using a mobile phone and that I was going to be locked up in a punishment cell for at least a week. My informer said he could arrange someone else to spend the time in the cell instead of me for a substantial payment of cigarettes but since despite desperate pleas to fellow inmates I was unable to raise the money, he said he managed to fix the problem for me without cost. Whether this had been a scam or not I don’t know for sure but I doubt it since I had promised to pay him after a few days. An offer which the inmate generously declined. The punishment cells allegedly had no beds or furniture. A prisoner was only allowed to wear his pyjama-like prison uniform, no jumper and no blankets or other possessions were allowed and it was then very cold at night ( often around 5 degrees ) as it was winter. Prisoners would usually be sent there for using mobile phones or breaking other prison regulations. They would usually spend a week in the cell and would also usually loose parole and prison visitation rights. I saw one man go down. He had been a real extravert – always smiling despite the depressing circumstances of our environment – but when he came back he had changed completely – he could barely look at you and his cheeks had sunk in while his body weight had obviously lost several kilos. About four days after my arrest and immediately following a court hearing I was taken in a van with around 25 children to a large prison in Cairo. On approaching the building where the children were to be disembarked we could hear an eerie wailing sound like a man crying in distress every two to three minutes but every time the noise was an exact repeat of itself and it was obviously beeing broadcast through the prison loud speakers. I can only imagine that the intention was to terrify newly arriving prisoners and it certainly had that effect on the children I was with when I heard it from the prison van. That was about four days after my arrest, possibly on 9 February. During the total of 12 days I was kept in the prison cell below Abdeen Police Station there was barely room to move ( see section 1 – overcrowding ) and we were only ever allowed out of the cell for a maximum of five minutes during visits and prisoners said that many of these visits were only possible through substantial bribes paid to officers. In any event visiting was only allowed in a tiny basement area in the immediate vicinity of the cell door and under the close eye of several overlooking police officers. At Tora Prison most inmates in my cell were only ever allowed out either to attend court or for Friday prayers in the prison mosque. Christians would be lucky if they had a visiting priest even once in a month. Only due to my special status as a Western foreigner was I usually allowed out for an hour on most days except Fridays and whenever there was a shakedown in any of the cells which usually occured at least once a week. Even so, this involved waiting by the cell gate, sometimes for hours, until the guard would give me permission, and then I was only allowed on to the narrow prison walkway which connected the cells on the first floor. Even then it was not easy to walk as the walkway was obstructed in many places by hanging washing and was barely wide enough to pass anyone who might be standing. There was a dilapidated basket ball court in the yard outside but I was told no one had been allowed to use it for over a year. One day however a rumour spread that a human rights organization would visit the next Saturday and one of my friends noticing I was looking very depressed pressured me into putting my name on the list. I was a bit reluctant as I’m absolutely useless at any type of football but agreed as I wanted any chance to get out under the open sky. I hoped I wouldn’t let my side down too badly. However I needn’t have worried as when the day came, the cell door remained closed. There was no human rights group to visit and no basketball or football. In my cell at Tora Prison there were many inmates who had been waiting a court verdict for over three years and several who had been waiting for up to five years. Prisoners would frequently come back from the court to say that the judge and postponed their trial by another six months. At least one police officer at Abdeen was aware of the mentally handicapped man’s status. He was the officer who came down to conduct the evening roll call at which time we had to squat on our knees in rows of five ( khamsaat ). The mentally handicapped man would not squat. He didn’t even seem to understand the request. Other prisoners offered to beat him but the officer, realising he was mentally handicapped, allowed him to continue standing. 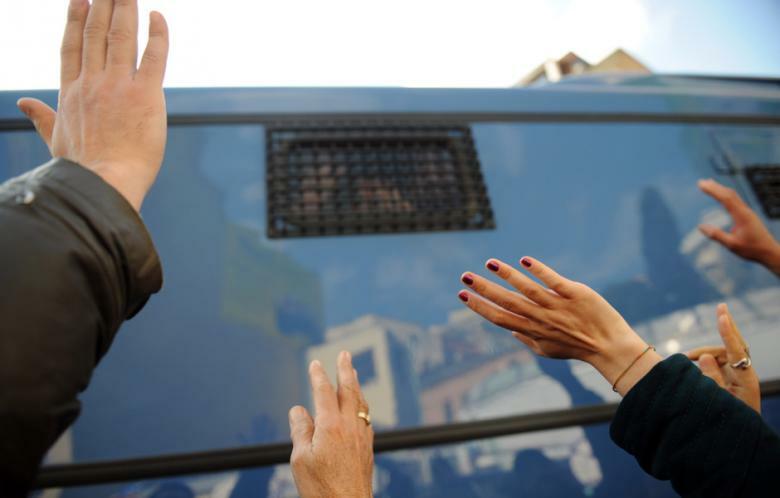 There were several instances when women were forced to share overcrowded prison vans with men. On one occasion the guards did change their minds. The van was so overcrowded that many of us squatted handcuffed and crouched between the seats. The guards were simply shamed by the repeated shouts of haram alaik, what you are doing is wrong by Allah, from the prisoners. During transport to court prisoners would often not be allowed any access to toilet facilities in the court buildings despite often having to wait six hours of more for their court hearing plus an additional hour or more’s travel to and from the prison. This could seriously undermine a prisoner’s ability to think clearly about what he might need to say in front of the judge. It was also humiliating for prisoners to be faced with guards repeatedly turning down desperate pleas to be allowed to use a toilet. More seriously it discouraged prisoners from drinking prior to the van transportation to and from the courts during which vans, as mentioned earlier, might park in the sun for considerable periods of time. If you need to contact me about this or if you would just like to discuss any issue regarding prison conditions in Egypt or you have any stories or information you wish to add please either place a comment or email me at alisdare@gmail.com.